Every once in a while it's nice to have a quiet night in with your favorite movie. 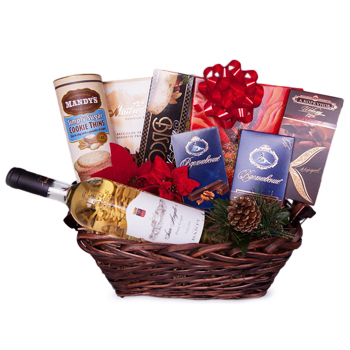 Help your friends treat themselves with a bottle of wine and sweets to make the night perfect. Your recipient will receive a fine bottle of dry White Wine, a box of gourmet Mixed Chocolates (250 gr), delicious Sugar Cookies (200 gr), a bar of rich Dark Chocolate (100gr), and more. Say Happy Birthday, celebrate a promotion, or treat yourself to A Night Of Pampering.